From a Three Bays Tour helicopter ride, which offers unhindered panoramas of the city, some of its vineyards, and imposing Table Mountain. 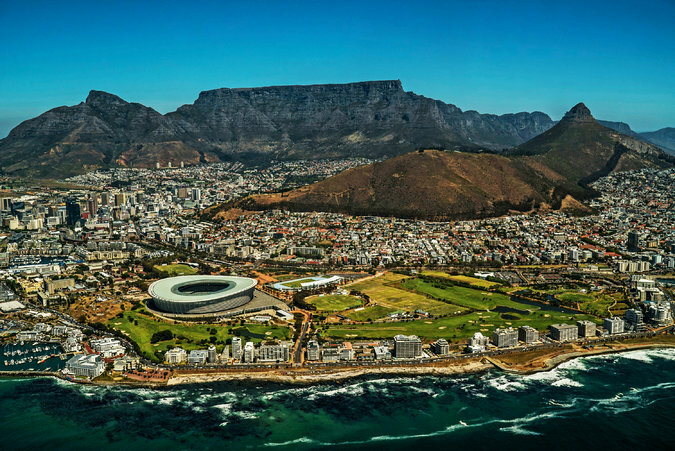 Mr. Buys would book our theoretical big-spender on a private helicopter tour of Cape Town and some of the city’s grandest neighborhoods and seemingly endless coastline. A mere 6,450 rand will get you on the Three Bays Tour, a helicopter ride with unhindered panoramas of the city, some of its vineyards and imposing Table Mountain. The tour starts by curving around Green Point, home to Cape Town Stadium, and then following the west side of the Atlantic seaboard to Camps Bay. Passing the Twelve Apostles (the mountains, as well as the hotel), our guest would swing up into Hout Bay before cutting over to Muizenberg, a beach community on False Bay, and pass Constantia, a suburb known for its wine production and wealthy residents (including, at one point, Charles Spencer, Princess Diana’s brother), on their way home. A cable car descending from Table Mountain. I also wanted a survey of Cape Town’s natural wonders. Instead of booking a chopper, I tackled two of the city’s most recognizable natural monuments: Lion’s Head and Table Mountain. The first spot, so named because of its head-shaped outcropping, which gazes out majestically over the city, isn’t nearly as tough to conquer as its name might imply. The hike, which takes around two hours round trip, is easy for the first two-thirds and moderate near the end, when the climb becomes distinctly more vertical. All the same, it is a good warm-up for the day for those who are in moderately decent shape — I saw people of all ages and sizes making their way up and down the 2,195-foot mountain. Table Mountain is a different story. It is a longer and tougher hike, but you can still conquer it and Lion’s Head and be back in the city before lunchtime — provided you cheat a little and take the cable car. After descending Lion’s Head, it was just a five-minute Uber ride over to the Table Mountain cable car station. 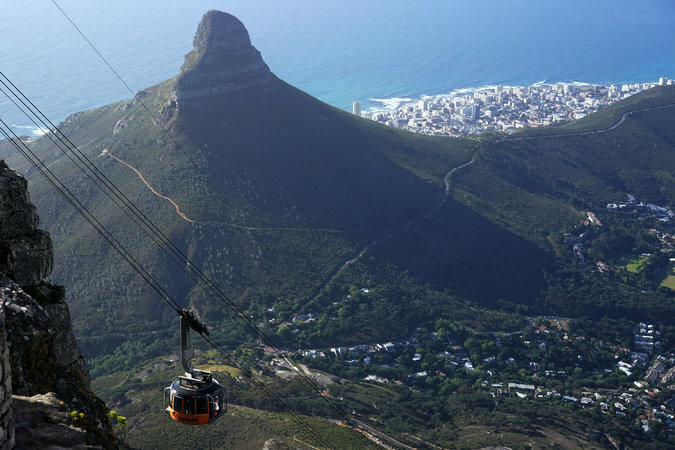 A round-trip ticket on the aerial tram, is just 290 rand and a fun ride that gives a great vantage point on the city. Once at the top, I particularly appreciated the beautiful view of Lion’s Head — the top of which I had just come from. Outside of the week or two the tram closes in the (austral) winter for maintenance, the back-to-back ascent of Lion’s Head and Table Mountain can be accomplished any time of day, morning or afternoon. At Chefs Warehouse you could go multiple days in a row and not have the same meal twice. They like to keep you guessing at Chefs Warehouse, the Liam Tomlin restaurant that constantly revamps its menu — you could go multiple days in a row and not have the same meal twice. 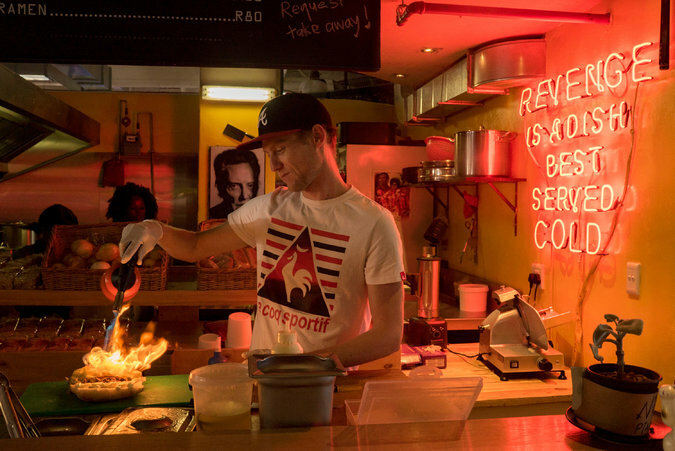 The diversity has made the restaurant a favorite in the Mother City, and even nabbed it a mention in the Discovery Series category on the World’s 50 Best Restaurants website. 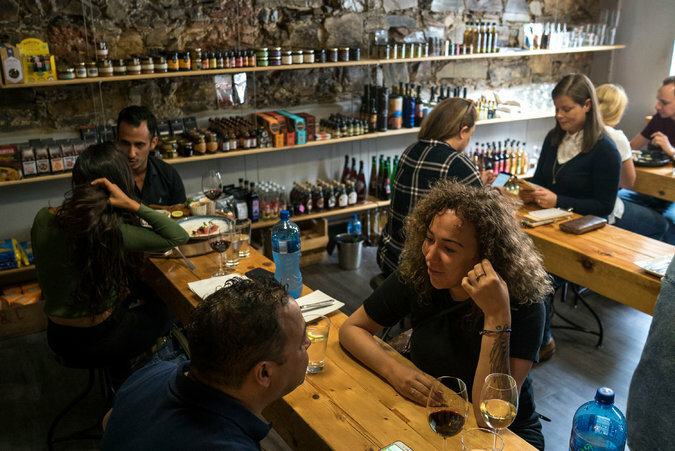 Influences on the 8-dish tapas menu will vary wildly, from China to the Middle East to India and back again. Diners might be served lamb kofta with marinated eggplant and yogurt alongside fried squid with caramelized pineapple and sriracha dressing one night, charred cauliflower risotto and duck pot stickers the next. Dinner for two runs 700 rand, not including drinks. A vendor at Mojo Market, a food- and clothing-focused indoor hall with dozens of stalls offering everything from burgers and beer to denim and jewelry. After (sort of) climbing two mountains I had worked up a considerable appetite. Having already explored the popular, Saturdays-only Neighbourgoods Market in Woodstock, I made my way to the newer Mojo Market, a food- and clothing-focused indoor hall in Sea Point with dozens of stalls offering everything from burgers and beer to denim and jewelry. Roughly six months old, the market had plenty of cheap lunch offerings. I ultimately opted for a soup and sandwich at Raclette, a stall that lured me over with the tempting smell of grilled cheese. The sandwich, Klein River Gruberg and Schärdinger cheeses between two slices of sourdough rye, was outstanding, and came with a decent cup of minestrone-like vegetable soup (75 rand for both). While I waited, I picked up a local Alpha dry cider from Jo’s Bar (35 rand) and listened to a couple songs from Paige Mac, a woman with an impressive, emotive voice and equally good guitar skills. 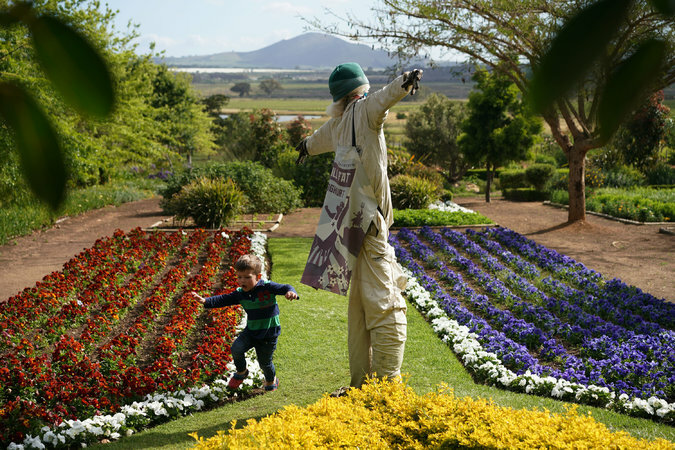 At the Fairview Estate in Paarl, outside of Cape Town, a young visitor walked past a scarecrow guarding a garden that resembles the South African flag. In the afternoon, Mr. Buys proposes booking our well-to-do guest on a tour of one the region’s greatest claims to fame: its wineries and vineyards. A leisurely tour with stops in Stellenbosch, Franschhoek, and Paarl can be tailored to the tastes of the guest, and may include visits to Haute Cabrière, located on a farm founded in the late 17th century by Huguenot Pierre Jourdan, or Fairview Wine Estate, which places a focus on environmental sustainability and ethical treatment of farmworkers. The series of wine and cheese pairings at different vineyards costs, including guide and transportation, about 4,200 rand, or $300. 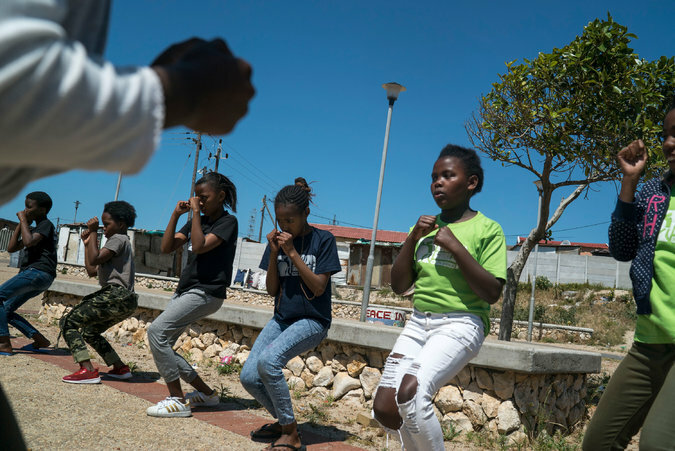 Girls at a Boxgirls South Africa after-school program in Khayelitsha township, which aims to empower young girls in need with education and self-defense skills. I was slightly apprehensive about leaving the manicured bubble of central Cape Town for the township of Khayelitsha, but I’m glad I did. I booked the trip, which revolved around a few hours with Boxgirls South Africa, a nonprofit that provides basic self-defense training, support and education for young girls in the township, one of the most violent neighborhoods in Cape Town, as an Airbnb experience for $29 (The price is currently $26). It was one of the more enlightening and inspiring things I did in the country, and provided real insight into how most nonwhite South Africans live. The trip, which did not include transportation to the township (I car-pooled with another participant and we each paid about 260 rand) was uneven at times: Our host, Nwabisa, had little experience leading tours and occasionally seemed at a loss for what to do next. Nevertheless, walking around the neighborhood and getting to know the organization and its mission was elucidating. The tour, which lasted from 11 a.m. to 1:30 p.m., included a filling lunch of chicken, veggies and pap, a local maize porridge. The view from the balcony of the upmarket Azure Restaurant. 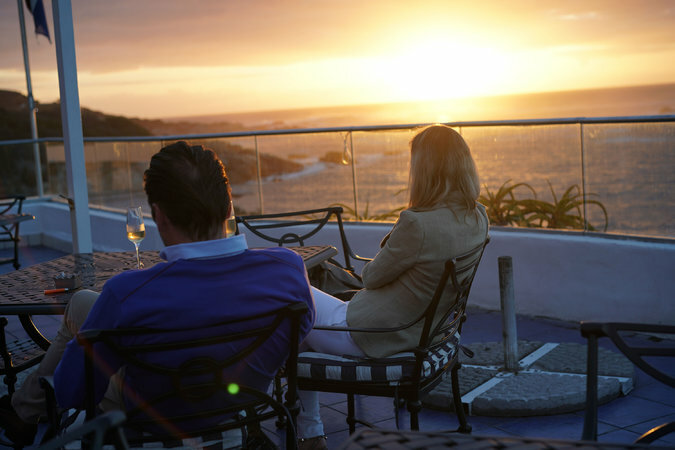 After a long day of sightseeing, Mr. Buys recommended dinner at Azure Restaurant, located in the Twelve Apostles hotel, with pristine ocean views. The tasting menu from the chef Christo Pretorius, at 735 rand, may include a chicken and ham terrine with pickled shimeji mushrooms, a hen’s egg with smoked hake, fish velouté, cured lemon peel, and bacon, followed by springbok (antelope) loin with venison osso bucco. Vegetarians and vegans can be accommodated. Thali is a small-plates Indian restaurant off popular Kloof Street. 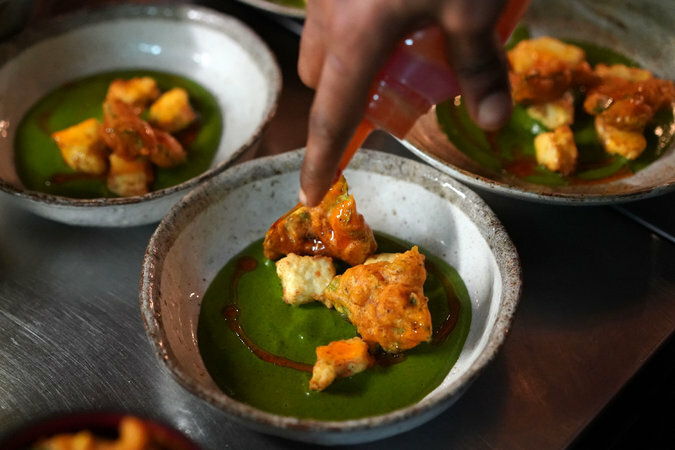 I had my own feast at Thali, a small-plates Indian restaurant off popular Kloof Street. For 325 rand, the kitchen sends you a seemingly endless assortment of food, most of which is excellent: Chicken and lamb kebabs, tandoori cauliflower with coconut and cashew, fried fish tacos in papadum, seafood curry with panch phoron (Indian five-spice blend with cumin and fennel). The parade seemed to never end — not that I was in any hurry for the meal to be over. An evening out on the waterfront and in downtown Cape Town may very well end at Bascule Bar, where a high roller can truly indulge his or her inner Gatsby with whiskey and cigars alongside high-priced yachts bobbing in the marina. Located in the Cape Grace hotel, Bascule has an impressive variety of whiskies to choose from, as well as a number of choice cigars. A pour of single malt whisky distilled at St. Magdalene (shuttered in 1983) from independent bottler Dun Bheagan will run you 925 rand. Fire up a Montecristo No. 2 Cuban cigar for an additional 435 rand and relax in an extravagant, malted barley- and tobacco-induced haze. Perseverance Tavern opened as a tavern and boardinghouse in 1808 and claims to be the oldest pub in the city. I strongly favor the modest, local pub — the lymphatic system of any good city — over fancy hotel bars. 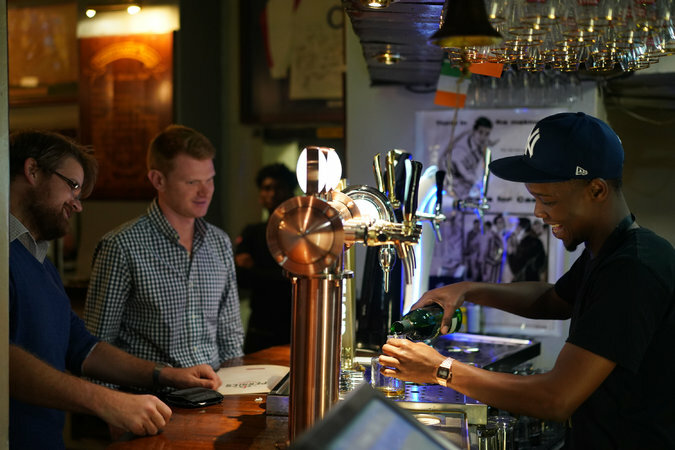 Perseverance Tavern may not be the hippest or hottest bar in Cape Town, but it may have the richest history: It opened as a tavern and boardinghouse in 1808 and claims to be the oldest pub in the city. 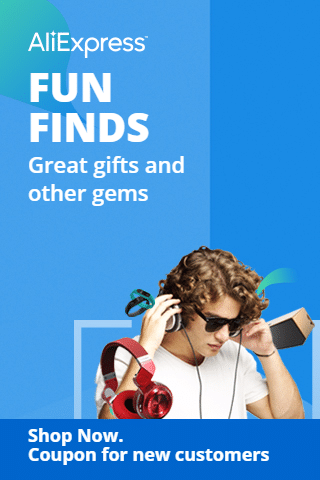 According to the bar’s website, famous figures in South Africa’s history — sports stars, dignitaries, even the controversial diamond baron Cecil Rhodes — trod the floorboards of the old Persies, as it iss known. That past is palpable at Persies, with old photos and mementos adorning the walls, but that matters little to a thirsty visitor. Fortunately, the house beer, a pale ale, was cold and refreshing. It was well priced, too (37 rand), and a fitting way to cap off my time in the Mother City — a place where unparalleled natural beauty and reasonable prices make for a great trip for any traveler, regardless of budget.